SPEAKING UP FOR A CHILD: Pictured from left to right – Songa Newell, CASA Volunteer; Jackie Ahren – CASA Program Director; and Judith Bollinger – CASA Volunteer and Coordinator. By Pat VerSteeg — The program past week at Kiwanis/Senior Citizens’ was about the Court Appointed Special Advocate (CASA) program. 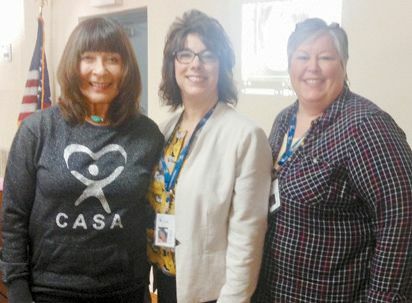 Jackie Aaron, CASA Program Coordinator, was the guest speaker and she also brought with her two CASA volunteers, Judith Bollinger and Songa Newell, who also was her mother.